Improper disposal of electronic media has caused headaches for businesses and individuals for decades. Digital information is one of the highest value assets, and is the most commonly targeted data in any security breach. Personal information on employees and customers along with critical operational and financial documents can bring significant returns to a hacker or a competitor- and put you out of business. One of the biggest mistakes that a company can make is disposing of electronic media (hard drives, CDs/DVDs, computers, and more) without properly destroying the data stored on the equipment. It’s a given that computers and external hard drives could hold critical information even after you delete it, but did you know that your fax machines, printers, copiers and even older digital phones store easily retrievable data? Just imagine if your competitors get a hold of every single number you called or faxed in the past year- or every document you copied in the past five years. One of the most important steps in an information security plan is proper disposal of equipment once it has been retired from use- more commonly referred to as media destruction. What Is Electronic Media Destruction? To virtually eliminate the risk of a data breach, you can just shred your media, but there are additional measures that your business can take to ensure your data is useless to anyone before it’s destroyed. Using software to overwrite your data to clear or wipe a hard drive is the first step in the process. 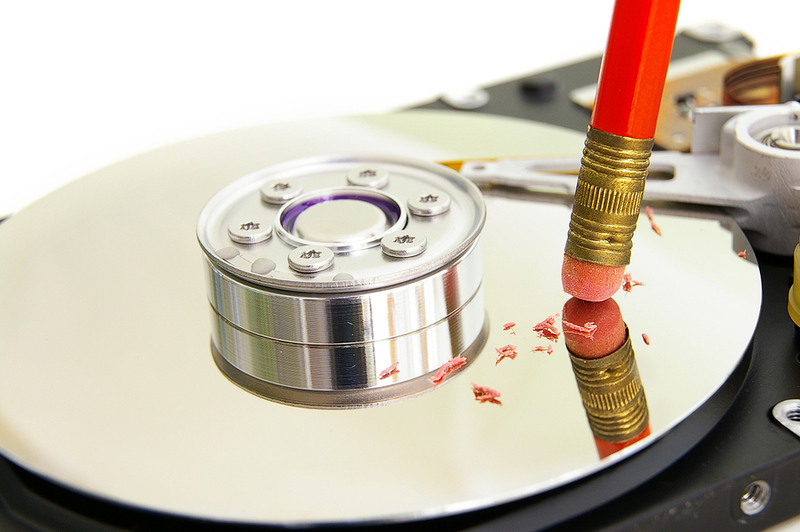 Data erasure overwrites the data and completely destroys all electronic data on a hard drive or digital media. Using this type of software before you send electronic media to be degaussed or destroyed ensures that no critical business information is transported off site, and eliminates the risk of unauthorized employees accessing the drive. 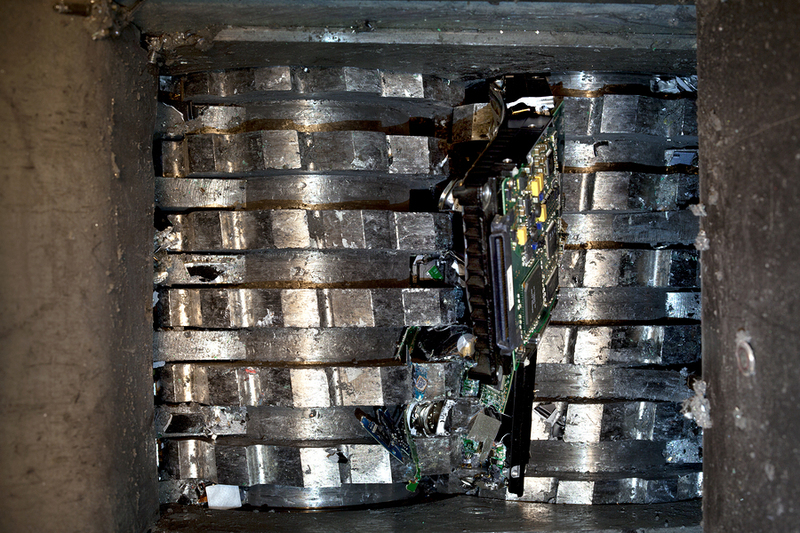 Degaussing uses an electromagnetic field to destroy data on a hard drive. This field, usually generated by a machine, renders a hard drive completely unreadable. Unfortunately, this doesn’t mean you can grab a magnet, run it over your hard drive, and call it good. You need to have a certified shredding or data removal company that specializes in hard drive destruction that has a degaussing machine that adheres to NSA and DoD standards to ensure your data is no longer accessible. If you have a hard drive that you want destroyed, there’s another option- crushing it. As you can see, the electronic media in these videos is virtually destroyed- but there is still a risk of your data getting compromised. That’s why it’s important to ensure the shredding company you select is NAID certified. That way, you can guarantee that your media is destroyed and disposed of properly. Many data destruction companies comply with the regulations and requirements for electronic media destruction by the National Security Agency and Department of Defense. These procedures include several of the destruction methods mentioned above (and depending on the type of media, several applications of each step). Shred Nations offers hard drive destruction and electronic media destruction services to ensure all the data on the electronic equipment you’re retiring is completely unrecoverable. Our trained staff of specialists that can help you decide the best course of action for your project. Our network of contractors allows us to come to your location if you need to ensure a proper chain of custody, or the ability to have you ship your drives to a secure facility to be destroyed. You are provided a certificate of destruction that details when and where the hard drive was destroyed, and then pieces are separated into component parts and recycled.